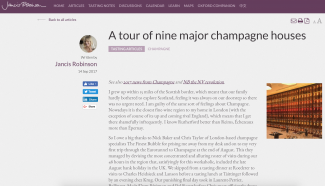 Jancis Robinson MW, accompanied by The Finest Bubble journeyed to Champagne at the end of August over a very congested Bank Holiday weekend and visited nine champagne houses. In her full write up (available to jancisrobinson.com members) Jancis speaks in depth on the experiences at each house and each is accompanied by very detailed tasting notes, if you’ve wondered what Bollinger Extra Brut 1914 tastes like, I suggest you register. Part of the reason for the visit was to gain an insight into our upcoming tasting at 67 Pall Mall in October, Prestige Cuvée vs Vintage Champagne. Whilst this was the basis of the visit, there were no complaints when deviations occurred and exceptionally old and rare champagnes were tasted. There is a staggering 129 reviews published in the article ranging from 1914 to unreleased previews of future vintages, as you can probably tell we had our work cut out over the two days. Read the full article via Jancis’ website here.